The Retreat Kitchen vegetarian cafe and juice bar. I’m a firm believer in purpose: we all have a unique contribution to make with our life on this earth. If we discover that best thing to do we are fortunate, and others are blessed. Sisters Laura and Lindsay Mensen are owners of The Retreat Kitchen, a very special place that helps residents and visitors eat and drink their way towards wellness. 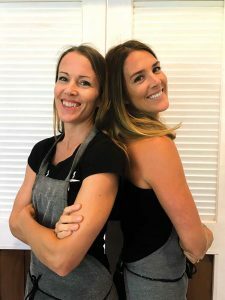 When I met Laura and Lindsay Mensen, owners of The Retreat Kitchen, a vegetarian café and juice bar on the upper level of Ports of Call Shopping Centre in Grace Bay, it was clear that they were operating in that “zone,” blending their life experience, training and talents to create a very special place that helps residents and visitors eat and drink their way towards wellness. Every time I have lunch at The Retreat Kitchen, my body feels cared for, comforted and sated. Every dish is a combination of natural colors, flavors and textures that appeal to every sense. Made daily with fresh ingredients, soups are thick without the use of heavy creams and rich with flavor from herbs and spices. Salads burst with color and contrast, combining greens, nuts, vegetables and cheeses (if you like), enhanced by exquisite dressings made with cold-pressed juices and oils. Even the treats, such as peanut butter chocolate chunk cookies, manage to be decadent and healthy at the same time! The feeling of being lovingly nurtured starts when you walk into the space. Its clean, white-washed appearance is accented with darker wood tables, potted cacti and a selection of raw-food and vegan cookbooks. The air is filled with a fresh lavender scent that is refreshing and relaxing. You can dine inside or outdoors on the balcony. The Mensen sisters glow with good health and a natural beauty and vibrancy that is the result of their approach to living. Laura and Lindsay were born in Canada, but spent many of their younger years in Turks & Caicos. Their father, Henry Mensen, was the original developer of Ambergris Cay. When he spent time at the Hippocrates Health Institute in Florida undergoing intensive alternative healing through diet, yoga and meditation, the sisters took note. 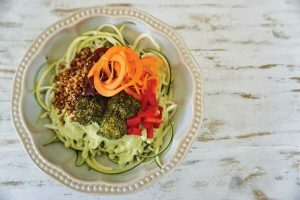 The zucchini bowl is one of the most popular lunch choices, regularly changing its primary flavours. They spent three months training at the Institute’s raw food program, witnessing miraculous transformations in their father, others and themselves. Laura recalls, “When we left, we felt physically light, healthy, clear minded and introspective—like we were learning a new way of being in the world.” Laura continued her nutrition training, acquiring her certification as a Holistic Nutritionist through a year-long intensive at The Institute of Holistic Nutrition in Toronto, Canada. Both sisters went on to gain extensive training in the Barkan Method Hot Yoga and, later, yoga teacher training through the Asheville Yoga Center and Rolf Gates Yoga. Eventually they returned to TCI to create wellness retreats at their father’s home on Ambergris Cay, emphasizing raw food, health and yoga. In 2013, Laura started a small business delivering fresh juice around Providenciales, with as many as 30 stops a day. In 2014, the sisters opened their own Retreat Yoga and Wellness Studio there, offering a variety of yoga classes, workshops and fresh-pressed juice and healthy, vegan snacks. Lindsay and Laura agree that they weren’t quite ready to start a restaurant, but took on the challenge full force. They were used to cooking wholesome and tasty food—raw, vegan, vegetarian and gluten-free—but not in quantities to serve more than a family. At the beginning, they laugh, the lunch combination was a daily surprise. They slowly added soups, salads and sandwiches, treats and beverages a little at a time. 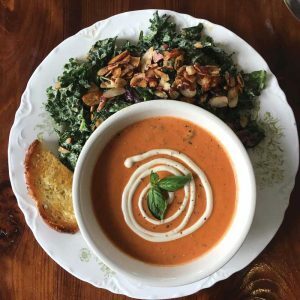 Now, there is a weekly menu from which lunchers can choose from a daily soup/salad special, along with a standard chalkboard menu including the popular zucchini bowl, summer rolls, and gourmet toasts, including fig and goat cheese, pear, blue cheese and walnut and the beloved avocado toast. Every day, The Retreat Kitchen offers a soup/salad combination, changing regularly with the availability of fresh ingredients. Like many restaurateurs, Laura and Lindsay say it is hard to rely on local farmers for a consistent supply of produce, although they use fruits and vegetables from North and Middle Caicos whenever available. Their father has a farm in the Dominican Republic and sends over moringa, cacao, and honey from his beehives that finds its way into sweet treats, including raw cacao bites. The first time I visited The Retreat Kitchen, I expected the customers to be either ultra-fit super-models or ethereal angels. It was a surprise to find so many residents in all shapes, sizes and nationalities. In fact, the sisters say about 80% of their business are residents, including many restaurateurs and business professionals. The rest are tourists who typically discover The Retreat Kitchen on the Internet and social media (TripAdvisor or HappyCow, Facebook/Instagram). The sisters believe in keeping their eco-footprint to a size 2. So at The Retreat Kitchen, you will find your meal served with “real” silverware, plates and glasses. Take-out containers are eco-friendly, biodegradable paper products whenever possible, and regulars receive a discount when they bring in glass jars to be refilled with juices. My friend Sara swears by The Retreat cleanses, and her sparkling eyes and clear complexion validate her experience. You choose from a liquid or food cleanse for three, five or seven days, then collect a bag containing your supplies for each day: de-tox true green juice, smoothie, healing broth and tumeric shot with an optional large salad or soup. The Retreat Kitchen is also branching out into catering, most recently serving vegan tapas at the opening of the luxury villa Coral Pavilion. They also offer regular workshops featuring a variety of health topics alongside naturopathic doctors of Grace Bay Medical Centre. In the future, Laura says, the restaurant will be open for pop-up dinners and as a wine and craft cocktail bar serving “biodynamic” wines and incorporating their fresh produce, juices and herbs for creative mixed drinks. The sisters hope to expand the existing space to open up much needed dining and kitchen areas. Caring for others within the community is another aspect to healthy living. Following the destructive hurricanes last fall, Laura and Lindsay prepared pumpkin soup, peas ’n’ rice and zucchini bread that was delivered by friend Dom Rolle and his crew to Islanders whose homes were severely damaged by the storm. The Retreat Kitchen also became a gathering place, as they had power, Wi-fi (and banana-walnut muffins) within days after the storm. I feel grateful that people like the Mensen sisters choose to dedicate their lives to helping the rest of us more able to enjoy ours. The Retreat Kitchen is currently open for lunch from 9 AM to 3 PM from Monday to Saturday. Delivery is available via the IsleHelp app. For more information, visit www.retreatkitchentc.com.